This kind of wet, Autumnal weather in Paris calls for salted caramel. And while the world is going nuts, let’s add that too. While I love making batches of warmed salted caramel sauce to pour on crêpes, cakes, ice cream, meringues and all sorts of creamy and apple desserts, there comes a time when we need a real crunch, something to bite our teeth into (and without breaking them). 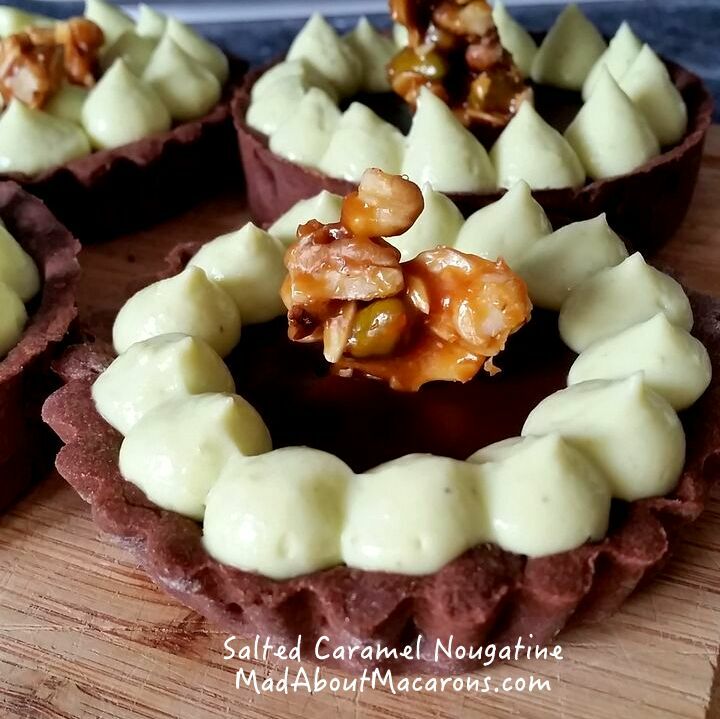 Le Crunch from this easiest nougatine recipe gives desserts like chocolate tartlets and rice pudding that extra special texture that can take it to another level, and it takes no time to prepare. I say rice pudding, as a respectful nod goes to Stéphane Jégo, chef at the popular Parisian restaurant, l’Ami Jean in the 7th (rue Malar). While his dishes are all fabulous, he’s particularly renowned for his addictively creamy rice pudding. It’s the kind of dessert many people shy away from after a big meal. “I can’t go for rice pudding – that will be far too much after all I’ve eaten.” Think again. It comes in a sharing bowl with a separate pot of salted caramel cream and a salted nougatine like this one with added peanuts. Last time we couldn’t finish it, Antoine asked for a doggy bag and we were still enjoying it the next day! What I love about this nougatine is how easy (in case you didn’t hear me say it yet) and quick it is: the caramel is made by heating the BUTTER FIRST WITH THE SUGAR directly and stirring. It’s quick too. I’ve adapted the recipe slightly and also toast the nuts lightly beforehand to bring out the flavours. 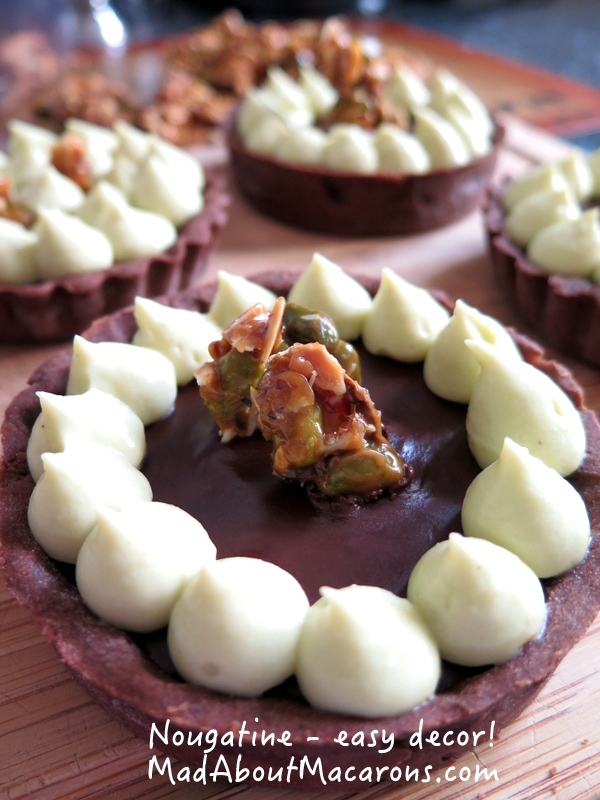 The crunch came when I made some double chocolate tarts from my book, Teatime in Paris. If you don’t have the book yet, then try a sample recipe of these tartlets (along with a review of the book) at Janice’s Farmersgirl Kitchen. I also played around with another recipe in the Eclair chapter and piped out some pistachio pastry cream on top. Chocolate, check. Pistachio, check. 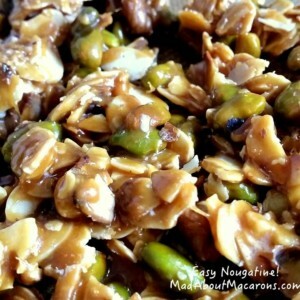 Add a chocolate macaron to finish off, or just try this easiest nougatine recipe! First place all nuts in a single layer on top of a non-stick baking sheet and lightly toast them under a hot grill for a couple of minutes. Keep your eye on them and don’t move away from the grill, as this happens quickly and you do NOT want them to burn (any burning will make the nuts bitter). Toasting them lightly brings out their wonderful flavour. When toasted, set them aside to cool. In a heavy-based saucepan, melt the butter on a medium heat. As soon as it’s melted, add the sugar. Using a wooden spoon, stir around the sugar and butter, continuing to stir until the mixture starts to form a liquid and a caramel forms. As soon as this happens and it’s golden (not brown), add all the nuts. 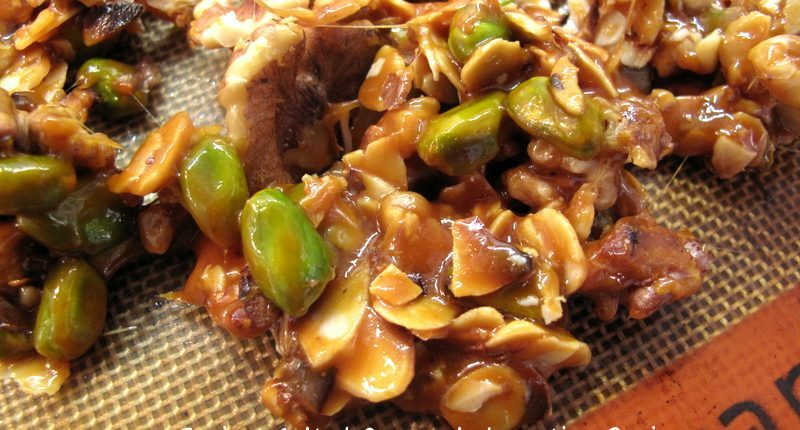 Stir around the nuts until they’re all well covered and sticky in the caramel. Turn out immediately on to patisserie mat (Silpat) or directly on to a clean, marble surface. Spread it out quickly and as evenly as you can in a layer (this will make it easier to break with your fingers later). 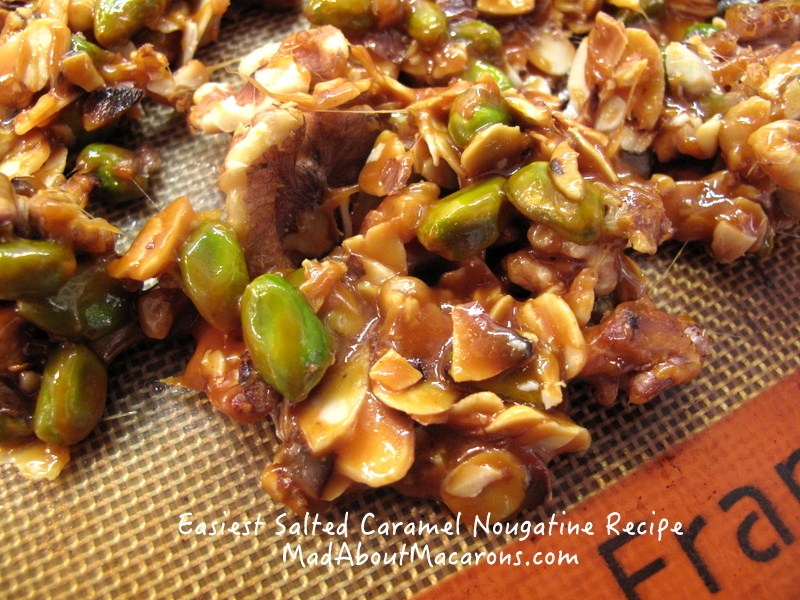 Leave to cool on the counter for about 15 minutes or until the caramel hardens. When cool, break into pieces and get deliciously decorating! A great topping for rice pudding, and many of the desserts in Teatime in Paris! Out of all the nougatine recipes that are quite particular this sounds great. I have put off making it because the recipes were so finicky. Now I find yours and definitely want to do it now!! Thank you ???? Thrilled to hear this, Bea. Yes, it’s so easy – and the beauty is that if you keep it in a sealed container, it lasts for ages and you can decorate desserts and cakes at the last minute! I should not have read this blog straight after a big breakfast. I want to eat this now!! I’ve printed the recipe – that’s a start. I made this with walnuts for a goat cheese salad last week! It is incredibly quick and easy, I agree! Would love to try it with pistachios as you have done! Lovely desserts, Jill! Really? With cheese? Now that’s an interesting combination with salted caramel! Your photos always leave me wanting more… I better get my apron on 🙂 keep posting great recipes!